One of the keys to the success and longevity of professional companies is their willingness to constantly uncover and analyze new industry trends. McRae takes continually evolves with our lighting technology and innovation. Lighting can be used to lure, sooth and highlight your exhibit in a very cost-effective way. Dazzling LED Lights. Nowadays you can transform the entire space using a targeted focus of light. There is indeed a science to light and shadow. This is a fun (and often not overly costly) way to bring a unique element into a booth that captures attention and draws people in for a closer look. High-quality LED lights are a simple yet surprisingly effective way to add hyper-bright pops of color to any display. 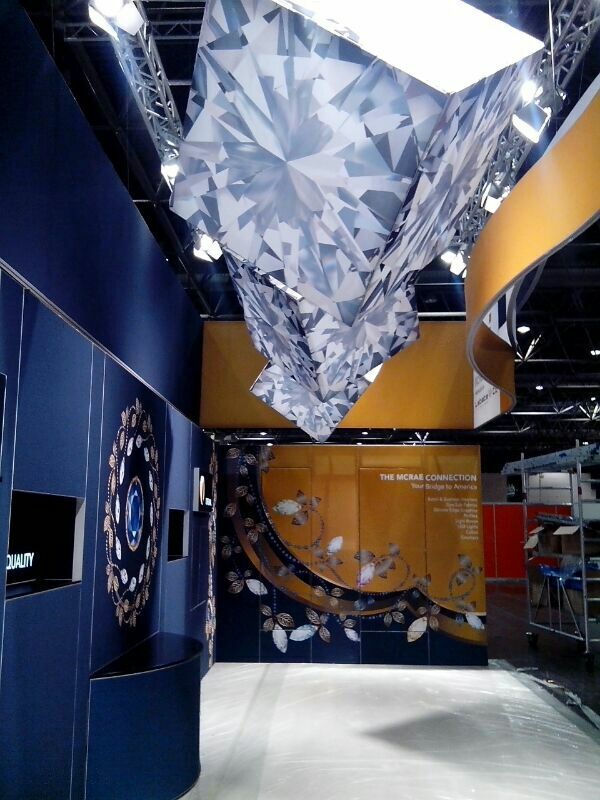 Their ease of use, versatility, and intensity can help you draw visitor attention to certain aspects of your exhibit. McRae makes our own LEDs, circuit boards so we do not have to wait for imports, there is no import taxes and the quality is outstanding. Projection. Light is an incredible tool, impactful both by its presence and absence. Finding new and creative ways to quite literally shine a light on products and spaces truly brings them to life. Projection technology has grown by leaps and bounds over the last few years, and trade show exhibits have been quick to see the potential. Projection mapping is a unique way to project imagery and light onto a static object, bringing it to life. High-quality, high-resolution projectors have shrunk to sizes that enable them to be placed almost anywhere, while a wide variety of surfaces (fabrics is our favorite) and material types may be used as screens in all different shapes and sizes. If you want to create an immersive visual environment and set the mood when presenting your brand, projections are a great way to do it. Cheap cialis buy online from http://www.dresselstyn.com/site/buy-cialis-ed-pills-online/ trusted and licensed pharmacies. Lighting Movement. As mentioned in an earlier post, but important to capture as a separate trend with respect to the structure. Your imagination is your limit. Our favorite is the northern lights effect. Our lighting allows companies to change color and provide movement at a reasonable price. We make all the circuitry and have the testing lab so we are able to manufacture these lighting effects a fraction of the cost of others. McRae’s lighting engineers and science lab support our customer’s in creating the lighting effects they want the customer to experience in their spaces. We make all the circuitry and have the testing lab so we are able to manufacture these lighting effects a fraction of the cost of others. Please call McRae at 905.569.1605 or email us at marketing@mcraeimaging.com to get information on our acoustic fabrics, innovatively fabricated structures and custom lighting solutions.